KIEV, Ukraine -- Ukraine successfully tested its indigenously developed, Neptun anti-ship cruise missiles system off the country’s south coast on 17 August. 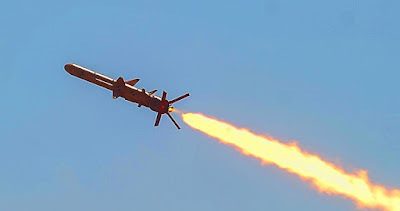 In the south of the Odessa region, the regular stage of tests of the Ukrainian cruise missile took place; Secretary of the National Security and Defense Council of Ukraine Oleksandr Turchynov attended the tests. “Today, during an important stage of the flight tests, a cruise missile of Ukrainian production has fully completed the planned program”, – Mr. Turchynov said adding that the maritime target was precisely hit at a 100 km distance. Secretary of the NSDC of Ukraine stressed that missiles of this class are powerful high-precision weapons “capable of destroying any sea and land targets”. “Ukrainian cruise missiles are capable of providing reliable defense of the Black Sea and Azov coast, affecting enemy vessels at distances up to 300 kilometers, if necessary, even in the ports they are based”, – he noticed. According to Mr. Turchynov, military and infrastructure facilities, in particular, “strategic bridges and ferry crossings in case of their use by the enemy for aggression against our state” may also be destroyed with the help of cruise missiles. The Neptun is a subsonic cruise anti-ship missile developed by the Ukrainian State Design Bureau ‘LUCH’ from Kiev. The new Neptun missile will use inertial guidance with active radar seeker to find its target. The missile is guided to its target at the final leg of the trajectory by commands fed from the active radar homing head and the radio altimeter. The new Neptun missile will be integrated into coastal defence cruise missile launcher and modern missile boats. When washing the brazilian hair extensions sale it is suggested to use a PH balanced shampoo or conditioner. Be careful about how much you use, and using conditioner on your human hair extensions sale more than once a month could damage them. After you put on the hair extensions, you need to be careful when dying. If your purpose of putting on the fusion hair extensions sale is for dying, then you need to follow one rule when the real hair is more than 70%, you can dye them properly, but it is suggested not to dye them frequently, and you need to pay attention to maintain them in time. Human Hair extensions serve as the perfect way to add a new style to your hair and can even add in length as well as volume. When using halo hair extensions sale for these purposes, you will want to remove them once you have worn them for three months. This not only helps to protect your natural hair but it also helps to protect your virgin hair extensions. Therefore there are some different and best ways to remove hair extensions that you should follow.